For a charming honeymoon, Siena, in the heart of the Chianti region, offers an ancient hamlet of houses dating back to the medieval period situated in quiet and panoramic location on the hills surrounding it. A skilful restoration helped preserving the original architectural features and the ancient charm. The hamlet offers 13 nice apartments, all of which tastefully furnished in a rustic style, decorated with beautiful beamed ceilings and ancient terracotta-tiled floors. 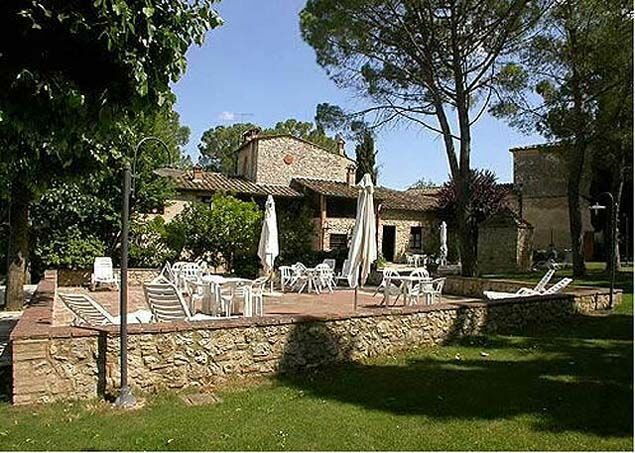 The property is surrounded by olive groves and vineyards and is the ideal destination for those who wish to enjoy a relaxing holiday in close contact with nature or spending a charming honeymoon in Siena. Distances: food shops 3 km, Colle Val D’Elsa with all kinds of shops 6 km, Siena 25 km, Florence approx. 40 km, Volterra 30 km, the medieval town of San Gimignano 16 km. At guests’ disposal: large furnished garden, swimming-pool (11 x 8 m – maximum depth 1,4 m – open from 01/04 to 31/10), solarium (10 x 10 m), playground for children, shared barbecue. Laundry with washing-machine and iron. Telephone (for outgoing calls) available. Covered parking within the grounds. Small pets are allowed. Extra serices: extra bed (€ 25,- / per week) and baby bed (€ 20,- / per week) available by arrangement, payment on the spot. Maid service available on request (to be paid locally). 70 m2. 1st floor: large living-room with kitchen corner, dining area and double sofa-bed, double bedroom, twin-bedded room, bathroom with shower. Covered terrace. Additional costs paid on site: Security deposit: € 155,-Final cleaning: € 60,-Heating: according to consumption.